Wholesale Trader of a wide range of products which include video borescope and boroscope. The FLIR VS70 is a rugged, waterproof, and shock-resistant videoscope with a large 5.7-inch color LCD display. It features intuitive handset controls that enable users to maneuver the narrow camera probe into tight spaces to deliver vivid and sharp video and images. 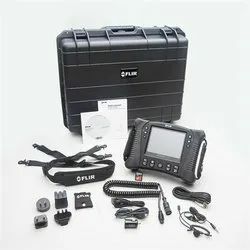 Advanced inspection solutions, expansion cameras, and add-on accessories enable users to expand their FLIR VS70 to address many different inspection needs. The HDV610 Kit includes an Inspection Camera with a 5.5 mm Flexible, 60-Degree FOV, Macro Probe (1m) and an HDV600 VideoScope with 5.7 in. color LCD TFT with high definition 640 x 480 resolution. Compact, high-resolution water-proof camera probe and four built-in bright LED lamps with dimmer control illuminate viewed object and provide glare-free close-up field of view. The SD memory card stores more than 14,600 images.